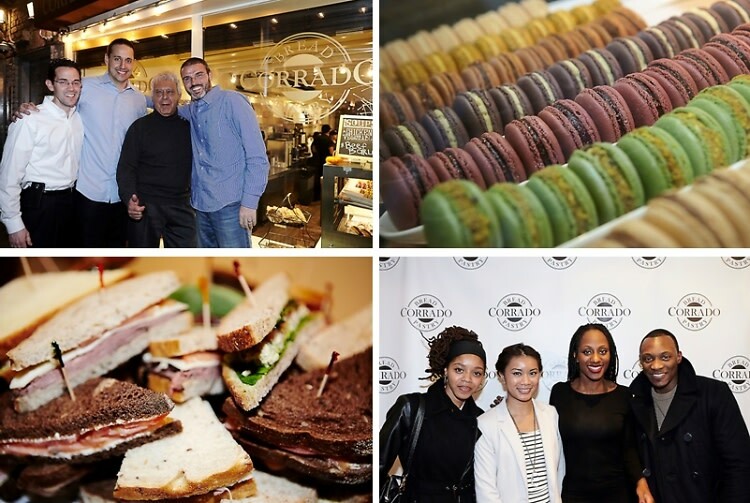 Last night, Corrado Bread & Pastry opened their doors to foodie fans, press and media of their new location on 833 Lexington Avenue. Guests were welcomed in from the cold and greeted with warm Corrado Cappuccinos, a signature staple, along with hot chocolates, lattes and Americanos. Guests were treated to a sampling of some of Corrado’s most well-known menu favorites including roast beef, smoked salmon and basil chicken salad sandwiches. The spacious area allowed everyone to mingle, while some sipped on Onli beverages and Zipz Wine as they moved onto dessert offerings. The Corrado crew supplied everyone with scrumptious apple, blueberry and chocolate muffins, cranberry scones and apricot danishes. Yes, there was even gluten-free cheese puff pastries that didn’t disappoint. At the end of the night no one left empty handed. Each guest took home a small assortment of macaroons, biscotti and cookies. If you weren’t able to make it last night, Corrado’s serves all these goodies and more daily, 7 days a week. Stores hours are the following: Monday-Friday 7am-8pm; Saturday 8am-9pm and Sunday 9am-7pm. When you head on over, don’t forget to share your experience using the hashtag #Corrado833Lex to showcase your favorite menu items. Click HERE for more photos from the event and be sure to tag yourself and your friends!